I based the recipe for Sriracha Crackers on last season’s Pumpkin Sage Crackers (a post that interestingly enough, delved into what it is like for a fan to watch pain), thinking I could just switch out a half a cup of pumpkin puree with a half a cup of Sriracha. Nothing I’d ever eaten before ever hurt so much. There was sweat and there were tears as the world caved in around me and every fiber of my being rebelled against these crackers. Yet I kept eating them, just a few crackers at a time over the course of a week until they were gone. While eating the second attempted batch of Sriracha crackers — 1/3 cup chili sauce, increasing the amount of milk in the dough — Bry laughed at me each time I’d eat one cracker than run to the fridge for a spoonful of yogurt or sour cream to deaden the painful heat torturing my tongue. Despite the pain, I couldn’t stay away from these spicy hot crackers and they were gone in a few days. Third batch was the trick. 1/4 cup Sriracha sauce and nearly 5/8 cup of milk. Still hot, still tasty, still painful, but not so much so that the eater couldn’t win out over the spicy cracker. Crackers that could be consumed over the course of a single afternoon, not an entire training camp. 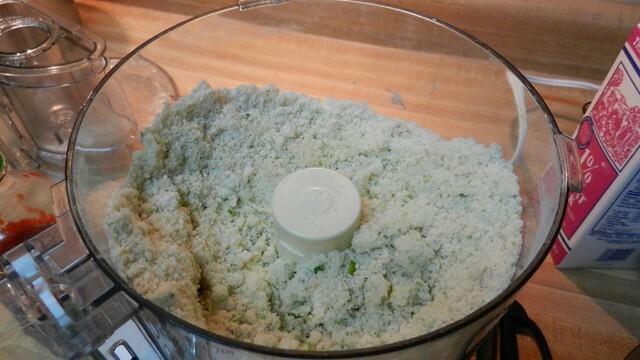 Using either a food processor, a pastry blender or two knives, cut together the flour, chives, 1 teaspoon salt and the cold butter until the dough takes on a granular, sandy consistency. 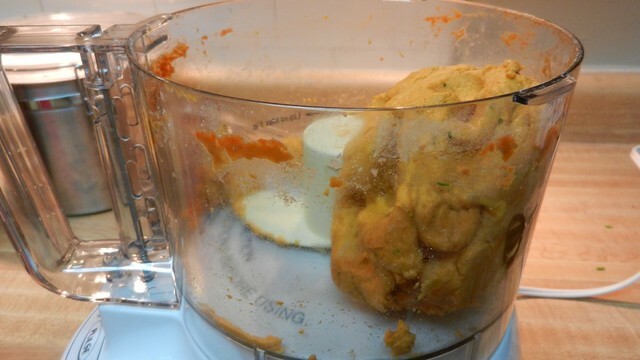 Slowing mix in milk or half and half until a moist dough ball is formed. If your dough seems pliable enough, there no need to add in all the milk called for in the recipe. Divide into three equal balls. Cover and rest the cracker dough in the refrigerator for at least 30 minutes. Lightly flour a piece of parchment paper or lightly oiled foil the size of a cookie sheet and roll out one dough ball. Give a light sprinkle of salt and cut into approximately one-inch squares using either a pastry wheel, pizza cutter or a knife. Don’t worry about the crackers at the edges being perfectly square. 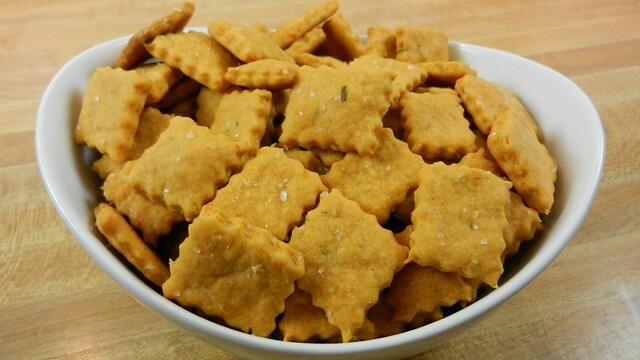 If anyone says anything about the irregularly shaped crackers, remind them these are artisanal crackers and if they want perfect squares, tell them there’s a gas station down the street where they will be sure to find bland shaped (and tasting) Wheat Thins that might better suit their palate. Who the heck invited Colts fans to your party, anyway? Move the uncooked crackers and lining onto a cookie sheet and bake for 12-15 minutes until the crackers have toasted up nice and crispy. If they seem a little soft but are starting to brown at the edge, have no fear, they’ll crisp up even more as they cool down. Repeat with the remaining two balls of dough. Serve with plenty of soda and beer to help stave off the exquisite pain of the Sriracha baked into a flaky cracker and be glad your pain is just a snack you eat and not someone named Big Snack hitting you. Like Sriracha? 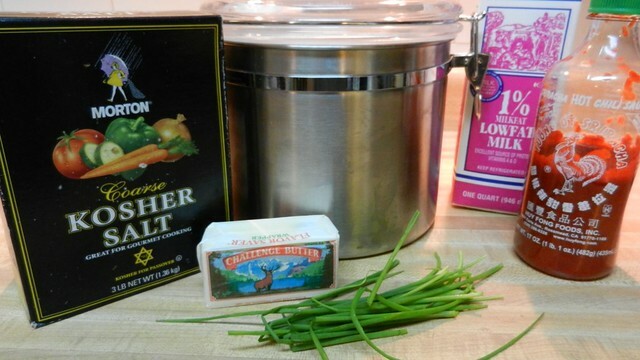 Try our Sriracha Fried Pickles recipe. Still time to join the Football Foodie Pick’Em league. Spicy crackers! So, so very spicy. 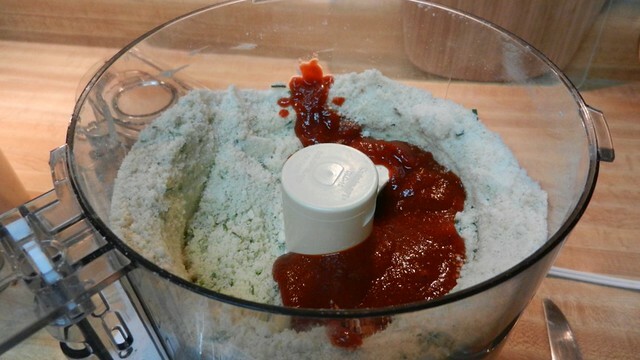 Using either a food processor, a pastry blender or two knives, cut together the flour, chives, 1 teaspoon salt and cold butter until the dough takes on a granular, sandy consistency. 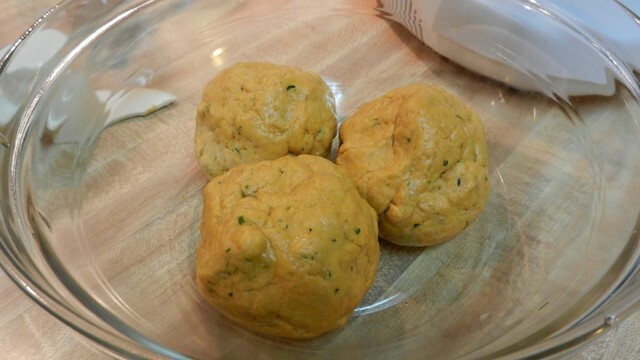 Slowing mix in milk or half and half until a moist dough ball is formed. Divide into three equal balls. Cover and rest in the refrigerator for at least 30 minutes. Lightly flour a piece of parchment paper or lightly oiled foil the size of a cookie sheet and roll out one dough ball. 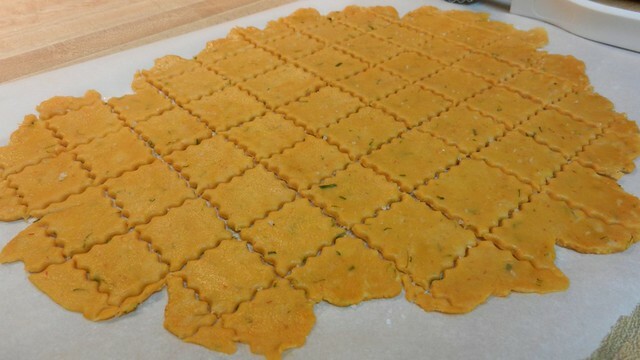 Score with a pastry wheel, pizza wheel or knife in desired cracker shape and sprinkle with kosher or sea salt. Move the dough and the liner onto a cookie sheet. 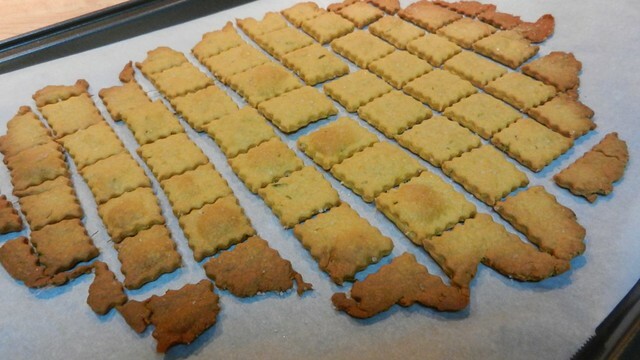 Bake for 12-15 minutes, until crackers are crisp. Repeat baking for remaining two dough balls. Prep time includes 30 minutes rest in refrigerator. Rolling out the dough on parchment paper or foil makes it easier to transfer the dough to your cookie sheet, prevents sticking and burning the underside of your crackers. Crackers will crisp up even more as they cool down after baking. How long will these crackers last? I am looking for a sriracha snack to send my boyfriend who is deployed and thought these would be great, but they would have to last about a week. Thoughts? I am so sorry for the slow reply! For some reason, your comment didn’t show up in my feed. They last about two weeks, depending on tightly you seal them up. Have you ever tried to add cheese to these? I am wondering if I’d need to make any changes to the recipe to add cheese.. Sorry for the slow reply, in the middle of moving! 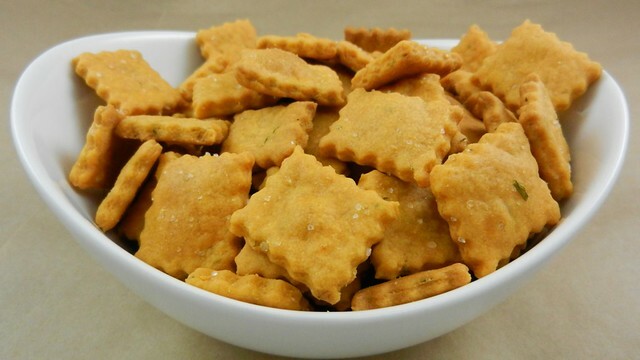 I haven’t added cheese to these, but based on other small biscuits and crackers I’ve made I’d use a drier cheese like parm in a cracker like this as not to make them too oily.